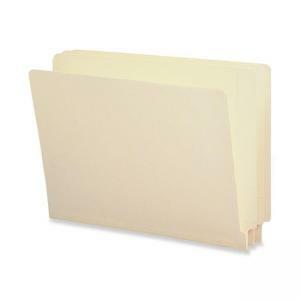 Sheet Size: 8.50" x 14"
Smead 27160 End Tab Legal Folder -8.50" x 14"
Shelf-Master folders feature a double thick tab for strength and durability. Straight-cut, 1/2" high tabs have embossed lines for easy application of color-coded labels. The 1/4" deep undercut front panel helps labels stand out for extra readability. Ideal for medical, dental, and hospital filing systems as well as for large institutions and insurance companies. Offers 9-1/2" high front panel 9-1/2" high, and rounded top corners in front and back. The folders are made from 100 percent recycled and 30 percent post-consumer material. 11 point manila stock. Acid-free.